It is the time of year when we long for change. As I write this, I look out the window at snow swirling around in mini-tornados, caught in the nooks and crannies of buildings on campus. By the time this piece is published, the weather will have changed. Most of the snow will be melted, and the change to spring will be well underway. The Christian church, too, celebrates perhaps the biggest change of all in this season, the shift from the mourning and repentance of Lent to the joy and exhilaration of Easter. This season of change is an appropriate time to reflect on the changes facing higher education. There is no question that higher education in the United States is changing, a change that is seen in everything from the kinds of colleges that students attend to what they study to how they pay for their classes. In his book The Marketplace of Ideas (2010), Louis Menand, an English professor at Harvard, examines the tension between the ­nineteenth-century model of the American university and the realities of twenty-first century life. He writes, “The American university is a product of the nineteenth century, and it has changed very little structurally since the time of the First World War. It has changed in many other ways—demographically, intellectually, financially, technologically, and in terms of its missions, its stakeholders, and its scale—and these changes have affected the substance of teaching and research” (17). Menand’s analysis situates the university between change and constancy and highlights how it is vital for institutions of higher learning to recognize and respond to these conflicting forces. One of the most apparent and immediately recognizable changes these volumes address is the shift in the way religion both is treated by and affects institutions of higher learning. In No Longer Invisible: Religion in University Education, Douglas Jacobsen and Rhonda Hustedt Jacobsen argue not only that religion is playing a more prominent role in American higher education in the twenty-first century, but also that the role it plays today is more complex than it once was. As a result, they claim, we need to ask better questions than simply, “[H]ow does religion connect to higher education?” (46). After laying the groundwork for these initial claims, the Jacobsens proceed to highlight key intersections between religion and higher education that have the potential to provide those involved in American higher education with the foundation for asking more thoughtful questions and, as a result, uncovering more nuanced answers. Using a series of anecdotes from their survey of a wide variety of colleges and universities, the Jacobsens identify six sites of overlap between higher education and religion: religious literacy, interfaith etiquette, the framing of knowledge, civic engagement, conviction, and vocation. With its broad examination of these issues, No Longer Invisible functions as a survey of many of the interesting and provocative trends seen in higher education and provides a helpful introduction to the current state of religion in higher education. Furthermore, the Jacobsens’ study points not only to ways in which those involved in higher education can ask more thoughtful questions, but also to possible areas of future inquiry. For instance, in the chapter on religious literacy, the Jacobsens provide the example of how some white male Christian professors felt they did such a good job of presenting various religions that “their students became convinced they were followers of those religions.” Women scholars and scholars of color, however, “questioned whether anyone could be quite so neutral or convincing when teaching about another religion” (67). This anecdote highlights religious literacy as a way to enable students and faculty to engage more completely with others’ religious beliefs, but also points to relationships between religion, education, and forms of difference such as race and gender as valuable avenues of future inquiry. No Longer Invisible succeeds in its goals of offering up new questions about religion in higher education that are sensitive to the complexities of the twenty-first century and providing a valuable foundation for future works that will examine similar trends. Susan VanZanten’s book, Joining the Mission: A Guide for (Mainly) New College Faculty, examines the theme of change and transition but focuses on the individual faculty member, rather than on the American university writ large. VanZanten’s book joins the crowd of recent publications for new faculty members; however, her guide is more specifically targeted to faculty beginning work at mission-driven institutions. Even with this focus, much of VanZanten’s advice would be useful for any new faculty member. Her second chapter, for example, provides a very useful “brief history of Western higher education,” and she makes a number of very specific suggestions about incorporating group work into the classroom, both of which would be helpful for graduate students and new faculty members at any institution. Yet what truly sets VanZanten’s volume apart from other new faculty guides is its exploration of vocation. In the final chapter, entitled “Composing a Life: Balance and Improvisation,” VanZanten writes, “One of the most pressing ­concerns I regularly hear from emerging faculty is how they can lead a balanced life…. How can you be a superb teacher, a productive scholar, and an involved academic citizen, and maintain your sanity? How can you balance your personal and your professional life[? ]” (190). In the rest of the chapter, VanZanten’s advice calls to mind Abraham Joshua Heschel’s The Sabbath (1951) as she offers suggestions for creating rhythm within life that can help faculty resist becoming overwhelmed by the tasks of everyday life. By giving her readers room at the end of the volume to breathe and consider the framework for understanding their chosen careers, VanZanten creates a volume that can be useful both for those faculty members just embarking upon their careers, as well as those who are pausing mid-stream to consider the trajectory of their lives and their vocations. 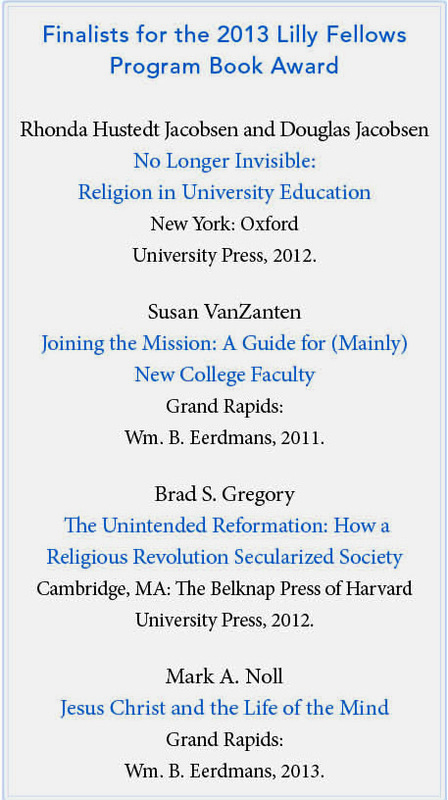 While VanZanten’s work focuses on the process of change within an individual faculty member upon arriving at a mission-driven ­institution, Brad Gregory’s The Unintended Reformation: How a Religious Revolution Secularized Society moves in the opposite direction, examining how the Reformation affected change in nearly every aspect of society. Gregory’s analysis of how the Reformation shaped and continues to influence today’s society is a tour-de-force of both religious and intellectual history. He makes fascinating and well-supported claims about how the worldview introduced by the Reformation affects a wide range of social forces and issues, including capitalism, higher education, and even global warming. Gregory adopts a genealogical approach in which he traces the shift in thinking throughout the history of six particular aspects of society. In Chapter 1, “Excluding God,” Gregory makes the claim that the Reformation, rather than science, is what eventually led to the exclusion of God from the examination of the natural world. He writes, “[T]he intractable doctrinal disagreements among Protestants and especially between Catholics and Protestants, as we shall see, had the unintended effect of sidelining explicitly Christian claims about God in relationship to the natural world. This left only empirical observation and philosophical speculation as supra-confessional means of investigating and theorizing that relationship” (40). Gregory then traces the effects of this doctrinal fragmentation and marginalization of Christian doctrine in the sciences “through deism to Weberian disenchantment and modern atheism” (41), showing how such a shift continues to affect society today. Here, Gregory is making a similar claim to his argument about the shift in thinking about the natural world. While he leads his readers through a dizzying thread of examples that support such claims, Gregory maintains a tight overall focus. Given the scope of this study, The Unintended Reformation will be appealing to a wide range of scholars, even though Gregory’s methodology is clearly that of a historian. And while he incorporates ideas from thinkers ranging from Machiavelli to Foucault, he takes care to make these more theoretical concepts understandable to those outside the academy. As a result, the threads of change that are traced throughout The Unintended Reformation are easy to connect to contemporary life, providing a useful paradigm for understanding the fragmentation of knowledge, power, and morality in the twenty-first century. While Gregory’s study of change is by far the largest in scope out of these four volumes, Mark Noll’s Jesus Christ and the Life of the Mind, the winner of the 2013 Lilly Fellows Program Book Award, examines a shift that is perhaps the most hopeful for those in Christian higher ­education. Twenty years ago, Noll’s The Scandal of the Evangelical Mind (1994) provocatively began, “The scandal of the evangelical mind is that there is not much of an evangelical mind” (3). In this most recent work, Noll opens very differently: “Christianity is defined by the person and work of Jesus Christ” (ix). The shift in focus here is immediately clear. While both works examine aspects of the Christian intellectual tradition, The Scandal of the Evangelical Mind looks at the intellectual tradition of the Evangelical community, while Jesus Christ and the Life of the Mind is centered on the teachings and work of Christ himself. This shift in focus reflects Noll’s overall change in attitude toward the relationship between the Evangelical mind and intellectual life. As he himself notes, if had had written The Scandal of the Evangelical Mind today, “it would have a different tone—more hopeful than despairing, more attuned to possibilities than to problems, more concerned with theological resources than with theological ­deficiencies” (153). Noll’s turn toward a more faith-based approach to Christian scholarship is accompanied then, by a turn toward hope as well. Throughout Jesus Christ and the Life of the Mind, Noll focuses on the actual beliefs and practices of Christianity. Rather than turning to scholars of intellectual history, philosophy, or higher education to make his claims, Noll instead turns to the Bible, along with theological writings and the major creeds. When making a claim about how the doctrine of Jesus as both human and God makes Christian scholars “predisposed to seek knowledge about particular matters from more than one angle,” Noll turns to Acts 2:23, Nehemiah 2:8, and Psalms 77:19 to illustrate the “wisdom of that expectation” (46). He then examines the writings of four theologians—Anselm of Canterbury, Benjamin Warfield, Gabriel Fackre, and Michael Polanyi—to support the idea that while “the natural human urge moves to adjudicate competition among overarching claims,” for the Christian scholar who is used to the tension between Christ as God and Christ as human, “it will be a smaller step… to seek the harmonious acceptance of [some dichotomous intellectual problems]” (49). Noll maintains his focus on “the person and work of Jesus Christ” in the development of both particular claims and his overall argument throughout the volume. Noll’s argument in Jesus Christ and the Life of the Mind might, initially, seem like something that has been said before. “The great hope for Christian learning,” he writes, “is to delve deeper into the Christian faith itself” (22). At first, this claim might not seem to offer anything new. In fact, it could seem rather limiting: how can one be a Christian scholar of modernist literature, for instance, if one is focused on the teachings of Christianity? As it turns out, Noll advocates delving deeper into the Christian faith to inform the process of scholarship, rather than the subject. In his discussion of “contingency” in Chapter 3 (and later in Chapter 6), for example, Noll takes Jesus’ charge to “come and see” as a call not just for the original disciples, but also for academic scholars: “It provides an especially strong counter to the tendency of academics to trust their own conclusions instead of letting their ideas be challenged by contact with the world beyond their own minds” (55). He also identifies Christian faith as an antidote for the many temptations that come with an academic vocation: “pride to be cultivated in degrees earned, books published, honors bestowed, or interviews granted” and “callousness toward people of ­ordinary intelligence” to name two (61). Because of the emphasis on mystery in the Christian faith, however, Christian scholars “should be doubly aware of how limited their own wisdom is” (62). Noll’s charge to “delve deeper into the Christian faith” is not because key elements of the Christian faith are what Christian scholars should research, but rather, because they inform how Christian scholars can engage with their respective disciplines. After examining how the Christian faith can encourage virtues such as contingency and self-denial that are beneficial to scholarship, Noll then spends several chapters demonstrating how this process would work in particular academic disciplines. In Chapter 5, he begins with his own discipline—history—arguing that the limits of knowledge within Christian thought “provide some reassurance about the potential for grasping actual historical fact” (84). He expands his discussion of the importance of “coming and seeing” in Chapter 6 in his discussion of scientific disciplines, pointing out how a Christ-centered approach to scholarship can be useful in “humbly” and “nondefensively” tackling difficult questions such as those about evolution and the origins of the universe (121). Finally, in chapter 7, Noll approaches Biblical studies, arguing that “[f]or a truly biblical view of the Bible, it is important not to treat the Bible as a storehouse of information sufficient in itself for all things but to embrace, rather, the Bible’s own perspective that leads its readers to a God-ordained openness to all things” (129–130). These case studies leave much room for academics outside of these three disciplines to engage with his ideas and consider how their own particular disciplines might be affected by a Christ-centered approach to scholarship. In this way, by ­exploring how Jesus’ teachings can be applied to several disciplines, Noll makes a strong case for defining Christian scholarship as an attitude and approach that can inform the study of nearly anything. As a result, Noll’s book is an extremely useful answer to the question, “What does it mean to be a Christian scholar?” Not only does it provide a concrete answer to this oft-discussed but seldom answered question, but it makes a strong argument for why being a Christian scholar can actually strengthen the quality of research and inquiry, rather than limit it. The fact that this book is addressed to individual scholars, rather than addressing larger issues of the university or society, adds further value to Noll’s claims. It provides concrete suggestions for Christian scholarship that can be acted upon immediately, rather than pointing to larger trends that seem out of reach for individuals to address. Ultimately, in Jesus Christ and the Life of the Mind, Noll does more than describe changes seen in society or in the academy. He provides his readers, whether they are Christian scholars, scholars at faith-based universities, or engaged readers outside the academy, with ways of understanding how they fit into these larger patterns of change, and even more importantly, with ways of making this change their own. Jennifer Miller teaches English at Normandale Community College in Minneapolis, Minnesota.